East Texas is a wonderful area to settle, whether you’re looking to relocate or just want a great place to retire. Access to top-of-the-line medical facilities; convenient shopping centers; great golf, tennis, and other recreational activities; beautiful weather; and friendly people are just a few reasons East Texas was chosen as one of the top ten places to live. This area has many gated, non-gated, large lot, and other developments, with various amenities and styles to fit your lifestyle. Cambridge Bend Estates offers a community pool and pavilion east of South Broadway Avenue near The Villages at Cumberland Park. Its convenient location and beautiful neighborhoods with homes previously featured in the TABA Parade of homes make it a great choice for those looking in TISD. The Southhaven addition is located in the Flint Gresham area, offering lots and homes on .5 to 1 acre. Located in TISD and near Owens Elementary. It is a great place to call home. Spruce Hill Estates is a gated community Near Gresham and Flint on CR 140. near Owens Elementary in TISD. Chapel Woods near the University of Texas at Tyler is located in Chapel Hill Independent School District. This development is on Old Omen road and is surrounded by the prestigious Woods subdivision and luxury senior living center The Hamptons. Quick access to Grace Community School and Lake Tyler make it a wonderful place to call home from elementary to college. The Crossing offers gated neighborhoods near Old Jacksonville Highway. Varying home-site sizes and garden home on wooded lots with access and views of several lakes. Areas include Lake Pointe, Lakeside 1-2-3, Timberlake, and Crossroad Estates. Grand Oaks Estates within the Crossing is the first gated development open, with at least two additional gated areas planned. The Crossing features its very own town center called The Market on Old Jacksonville Highway, and an Office center called The Offices at The Crossing. This mixed-use development in TISD near Three Lakes Middle School and Jack Elementary is perfect for the homeowner who wants an all-inclusive experience. Deer Run is a gated community located in Chapel Hill that offers great leveled home-sites for building. Eight of these sites are waterfront lots on the private lake. Lots are .6 to 1.6 acres. The community has a nice pool and common areas for gatherings and recreational activities. Forest Glen is a gated and fenced community just 10 minutes from South Loop 323. One acre and larger wooded lots offer privacy and a scenic setting for those seeking refuge from the daily hustle and bustle in TISD. Tall Timbers Estates is located East of Gresham in TISD near Jack Elementary. Lots and home-sites vary from .25 to 1 acre. The neighborhoods amenities include walking trails and a private lake for fishing. The Villas of Hollytree are near the corner of Grande Boulevard and Hollytree Drive. They offer homes with golf course or lake views and several amenities, including their own clubhouse, pool, and fitness center, along with adjacent walking trails and immediate access to the award winning Hollytree Country Club. This community in Tyler ISD and near South Tyler’s best shopping offers a luxury experience with all the conveniences. The Woods subdivision is located in Chapel Hill ISD and is near Grace Community private school. Gated neighborhoods and private lakes offer a variety of homes within this large development to choose from. Since much of Tyler’s growth has occurred in the past few decades, the city does not have an abundance of historic areas. Of the ones that do exist, most are located just south of the original town square. 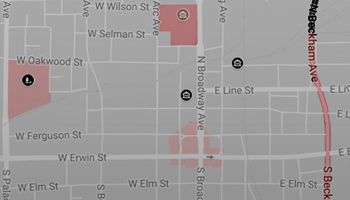 The largest of these areas is the Brick Streets Historic District, which encompasses 29 blocks and consists primarily of buildings built in the early 1900s. Many of these structures were originally built for middle working-class families, so single-family dwellings and duplexes are most prominent in the area. And as the name suggests, the neighborhood includes brick paved streets, as well as stoneline drainage channels. Tyler’s history is kept alive by the Historic Tyler organization who maintain the city’s historic structures. The Azalea Residential Historic District Nomination was approved and designated in June of 2003 as a National Historic District. Tyler’s largest residential concentration of early to mid 20th century homes which showcase diverse structures including Queen Anne, Craftsman, Classical Revival, Ranch, and International style. This district conveys not only the architectural heritage but represents the tremendous growth that Tyler experienced as a result of the discovery of the East Texas Oil Field. Charleston Park is more than a neighborhood – it is a community. The lovely streets and graceful aesthetics in combination with the community activities encourage a community where there are no strangers, but instead, friendly neighbors. The tree lined sidewalks, lamp-lit streets, meandering greenbelts, natural beauty, nature trails, and open park areas capture the spirit of a simpler time, giving an aura of serenity and relaxation. Charleston Park is a way of life, where family and friends is the cornerstone and when you buy a home here, you buy a community lifestyle with it. The home designs are very diverse, offering everything from singles to empty-nesters with varying details and sizes. Offering a network of paths, streets, resting areas, and other destinations that are designed to encourage bicycling and walking but are also suitable for vehicles,thus creating a wonderful feeling of community, identity and value. The Homeowners’ Association has an annual fee that is currently $600. The money goes to maintaining the pool, grills, pavilion, irrigating and maintaining of the greenbelt areas, walking trails, lake, and parks, as well as providing seasonal color at the front entrance. The dues also cover utilities for lighting and water and maintaining the streets. There is endless variety and options for entertainment, relaxation and recreation, including the following amenities: spring-fed lake, greenbelts with pines and hardwoods, cozy timeless sidewalks, swimming pool featuring grills and a pavilion, nature trails offering a great vantage point, and open areas for Frisbee or gatherings. Oak Hills is located on the West side of Old Jacksonville Highway near Fresh by Brookshire’s. It has its own Montessori School for children and is near Jack Elementary and Three Lakes Middle school in Tyler ISD. Oak Hollow off of Old Jacksonville Highway offers sub-communities such as Water’s Edge, Bishop’s Gate, The Shadows, The Stables, Shaddock Ridge, Hadley Court, and The Plantations. These communities were built with nature in mind. There are greenbelts, walking trails, neighborhood parks, natural lakes and wooded home-sites located in TISD. Oasis South is a development by Pyramid Homes, known for its energy-efficient construction. Community amenities include a playground, picnic pavilion, and a basketball court. It is located near Flint in Tyler ISD. The Rock Point addition is Located near Jack Elementary School just off of Old Jacksonville Highway and the Cumberland Road extension. It provides quick access to South Tyler’s best and newest dining, shopping and entertainment. Running Meadows is located Southwest of Flint on FM 346 in TISD. The Cascades Golf and Country Club community has many desirable features to anyone searching for a place to call home with activities. The clubhouse with the first covered tennis courts in Tyler; a European Spa, fitness center, and nature trails; a Lake Club including canoes, kayaks, ski boats, and fishing boats; and an 86 foot long swimming pool overlooking Bellwood Lake are just a few things The Cascades has to offer. The homes vary in style, from country manor to traditional Texas homesteads. House locations also vary, with some lots facing the lake or golf course and others nestled into the woods or perched atop one of the area’s rolling hills. The Cascades also has the only high rise luxury condominium in Tyler, Texas. The Stretford High rise condominiums feature beautiful views of both the golf course and downtown Tyler. This resort-like community conveniently located near the All Saints private school in Tyler, TX on Loop 323 also has apartments for rent and water-view condominium options on Belwood Lake. Holly Park luxury homes in the Holly Tree Subdivision B Old Jacksonville Highway in Tyler. It is conveniently located within Hollytree, where you have access to the Hollytree Country Club, Tennis Courts, Pool and Golf Course. Holly Park also boasts being near brand new shops and fine dining, as well as Fresh by Brookshires and schools such as Three Lakes Middle School, Jack Elementary and Oak Hill Montessori. Holly Star luxury homes in the Holly Tree Subdivision Bb Old Jacksonville Highway in Tyler. It is conveniently located within Hollytree, where you have access to the Hollytree Country Club, Tennis Courts, Pool, and Golf Course. Holly Star also boasts being near brand-new shops and fine dining, as well as Fresh by Brookshires and schools such as Three Lakes Middle School, Jack Elementary and Oak Hill Montessori. Hollytree is a large development and golf course in Tyler. It is located between Grande Boulevard and Old Jacksonville Highway. Hollytree offers two great gated sub-communities: The Winsford at Hollytree and The Villas of Hollytree. The country club and tennis court have been a staple in Tyler for years. It offers dining, swimming, fitness and tennis, as well as access to the golf course. Hollytree’s location and size offers many varieties of homes and fast access to Loop 49 and all the newest shopping such as The Villages at Cumberland Park, Fresh by Brookshires, and Target. This subdivision is also conveniently located near Robert E. Lee High School, Three Lakes Middle School, Jack Elementary, and Oak Hill Montessori. This gated community in the Holly Tree subdivision overlooks Hollytree’s beautiful golf course and 2 lakes, offering some of the best views in Hollytree. You get all of the benefits of Hollytree’s wonderful country club, pool, and tennis facilities with added security. Winsford is also conveniently located near Robert E. Lee High School, Three Lakes Middle School, Jack Elementary, & Oak Hill Montessori, and shopping such as Fresh by Brookshires, Target and the Villages at Cumberland Park. West of Tyler, on Jonestown Road at Toll 49, near Hazel Owens Elementary School. An exclusive, family neighborhood adjacent to Hollytree Country Club. It is located on Old Jacksonville Hwy in South Tyler. Not only is Ashmore incredibly convenient to all that Tyler offers – it is across the street from Brookshire’s superstore, FRESH Market, and it is in a high growth area to which many businesses are moving and some are building. Lot sizes are approximately 75′ X 120. Subdivision adjacent to Oak Hollow on Old Jacksonville Highway. conveniently located near Juls and Tyler shopping. Located in Tyler Independent School District near Three Lakes Middle School and Jack Elementary. Garden homes nestled in the Oak Hollow subdivision. Conveniently located near Old Jacksonville Highway, with many options for shopping and dining such as Swanns Furniture, Juls, The Catch, and more. This neighborhood is in Tyler Independent School District and is in close proximity to Oak Hills Montessori, Jack Elementary and Three Lakes Middle School. This large development near Flint Gresham in TISD is conveniently located to the New Cumberland Road extension. Offering a variety of homes and lots in South Tyler.